It’s been over a year since we’ve last written about Photobucket, when the former News Corp. / MySpace property merged with Ontela. Apparently, the Photobucket that came out of the merger didn’t technically have a chief executive at the helm, although CFO Tom Munro served as acting President. The company this morning announced that Munro has now been officially appointed CEO after an executive search was initiated by Steamboat Ventures, the Disney-affiliated venture capital firm backing Photobucket. Prior to Photobucket and Ontela, Munro was CFO of Vallent, a $70 million software company that was acquired by IBM in 2007. Before Vallent, he served as CFO of Quotesmith.com during their initial public offering. Photobucket isn’t exactly the first site that springs to mind (not to mine, at least) when it comes to sharing photos and videos online, but the company claims it’s still one of the leaders in this space. The company claims over 100 million registered members upload over four million images and videos per day via the Web and their smartphones or connected digital cameras. 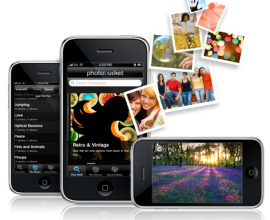 Earlier this month, Photobucket announced that it has inked a deal with T-Mobile USA to incorporate automatic photo and video upload functionality in the pre-installed Photobucket Mobile Application on the T-Mobile G2.